* Lisa Borch, a Danish teen. was aged only 15 in 10/2014 when she spent hours on YouTube watching footage of the savage decapitations of David Haines and Alan Henning by the Islamic State ‘s executor ‘John the Jihadist’ . Afterwards she and her radical Muslim boyfriend Bakhtiar Mohammed Abdulla, 29, an Iraqi immigrant, took a long-bladed kitchen knife and stabbed her mother Tina Römer Holtegaard at least 20 times at the home they shared in rural Kvissel. The court heard how she became obsessed with militant Islam after falling in love with an unnamed Muslim man. But he jilted her when he moved back to Sweden to be with his wife and children. A later police examination Lisa Broch’s computer showed that she had watched endless repeats of the beheadings of the two Britons. The court was told that Lisa Borch had teamed up with Bakhtiar after being dumped by her first lover. The two planned to flee together to Syria and fight for I.S.I.S. 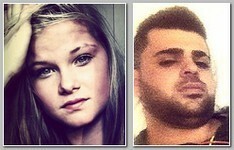 In court Lisa Borch and Bakhtiar Abdulla blamed one another for the killing of Mrs Holtegaard. He claimed to have only arrived to ‘help Lisa’ after the teenager had already killed her mother. But Lisa Borch said Bakhtiar Abdulla had actually been the knifeman. Although Bakhtiar Abdulla was no longer at the property when police arrived, investigators found his fingerprints in the victim’s bedroom. Lisa Borch was sentenced to nine years in prison, the first of which will be spent in a youth offenders institute. Bakhtiar Abdulla received 13 years and will be expelled from Denmark when his sentence is up. Both were ordered to pay around £40,000 in compensation to Mrs. Holtergaard’s husband – Borch’s stepfather – as well as her twin sister and a younger brother. Borch’s twin was in court to see her sister sentenced but did not look at her during the trial.